Manny Ruiz, Ph.D., joined the CEO last October. He brings 18 years of experience in student programing to the evolving experiential office. (Atticus Rice / McDaniel Free Press). Director of Student Development Programming Manny Ruiz, Ph.D., joined the Center for Experience and Opportunity last October. Now in his first full semester on the Hill, he’s already made a lasting impact on students and staff alike. Ruiz has felt that community investment since his first day. This friendly atmosphere has transcended from a campus stroll directly to his daily work. Ambrose has seen how Ruiz’s prior experiences in his field can add value to his work at McDaniel. Ruiz’s role puts emphasis on intentional student development programming, specifically for sophomore students. “So much is offered here as a first year student and when you’re in that sophomore slump there’s nothing here,” he said. To combat this, he’s assisted in developing and teaching the My Career course, which is the junior and senior component of the College’s new McDaniel Commitment initiative. Ruiz is also working with Associate Dean of Second-Year Students Stephanie Madsen, Ph.D. and Associate Dean of Students and Director of Residence Life Michael Robbins to create a sophomore resources program. His impact has already been felt elsewhere. 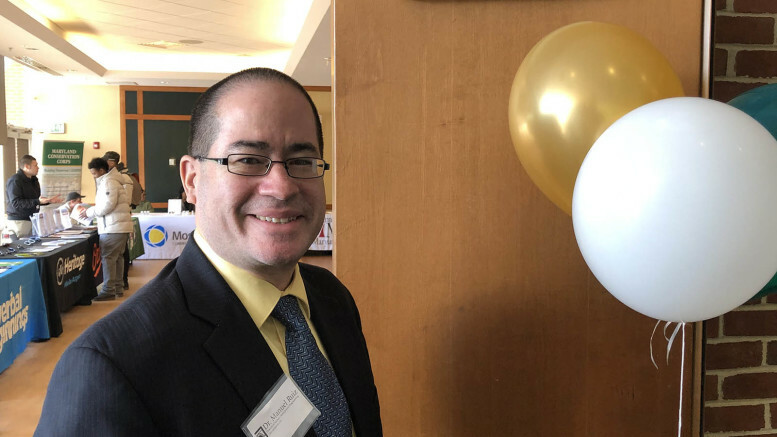 The history major at Montclair State University continued his education at the New Jersey college and earned a master’s in counseling in higher education in 2001. Ruiz later earned a doctorate in education with a concentration in critical race theory from Northeastern University in 2013. During this time, he spent the better part of 2008-2018 working at Gettysburg College in their career development office. At the Rt.-97 athletic rival, he organized their first job fair despite resistance. “I was always told no,” Ruiz said of his very first efforts at putting the event on. But he would always reply with “you don’t know if you don’t try,” so try he did. Naturally, one of the first large-scale projects he was tasked with was putting on the CEO’s spring career and internship fair, which took place in early March. To do so, he made sure students would want to come by bringing in desirable employers. “I was intentional in reaching out to seniors to see what they want,” Ruiz said. These included the U.S. Census Bureau, the FBI, and the Secret Service, among many others. Moving forward, he’s looking to bring an employer advisory board. This group would consist of about ten employers from various industries who could get to know the McDaniel student body and advise the College on hiring and recruiting trends, as well as what employers are looking for in recent graduates. Just approved, the board will leverage partners in for-profit, non-profit, education, and abroad sectors. At Gettysburg, Ruiz worked a lot with international students, many of whom weren’t aware of the resources and opportunities available to them. “I did everything I could in that role,” he said. He put on intentional programming to get international students in the door at places that aligned with their academic interests. “So many students were under the impression that they couldn’t do an internship, couldn’t do x, y, or z,” he said. He also worked the other side of the game, educating employers and faculty so that they could best help international students and allow them to successfully participate in events like job fairs. This type of work allowed Ruiz to learn extensively about leveraging partnerships in the name of community engagement. As part of the sophomore resources program, he envisions communicating with alumni so that students on the Hill can participate in job shadowing, informational interviews, and learn more about their job prospects. Ruiz would also like to see more involvement from the community to help prepare students for the job market. “I would love to implement a challenge to parents and alumni as a part of the McDaniel Commitment,” he said of accomplishing this goal. Ruiz wants to coordinate with the College’s major gift officers, too, by putting together talking points about the CEO and his initiatives so they can recruit interested alumni for these programs. “We all represent the brand,” he said of himself and other College employees working toward the same goal. At the end of the day, it’s all about the people for Ruiz. And the people are all about him.